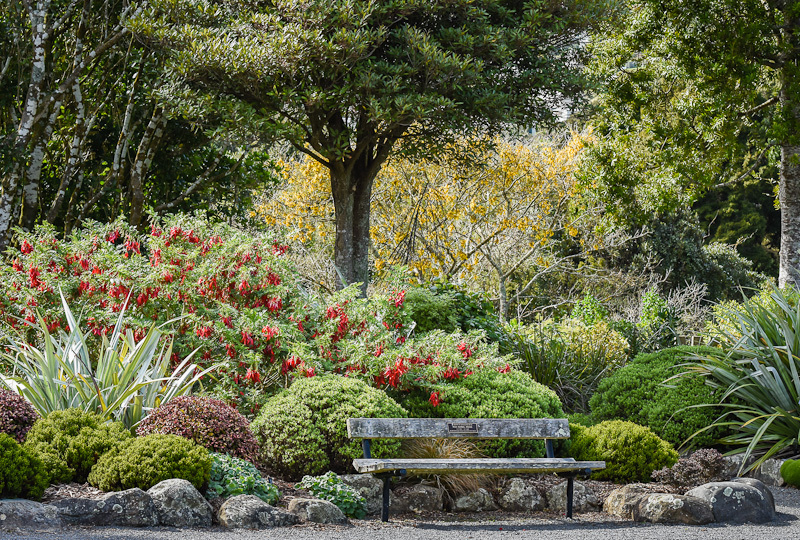 At Otari native plant botanic garden, here in Wellington, there are memorial seats/benches in places of interest and beauty. As I sit and enjoy them I often wonder about the people who are commemorated and their connection with the place, and I very much hope that they enjoyed the plants as I do. This seat commemorates Roa Isobel Irons with the words "No better place to be than here with family." Here by the Cockayne Lawn the family of plants looks bright and inviting with spring colours - scarlet kaka beak and golden kowhai flowers. And as the days lengthen and warm up, this is a place where families will happily play and picnic. Indeed there is no better place to be than in the beauty of nature.